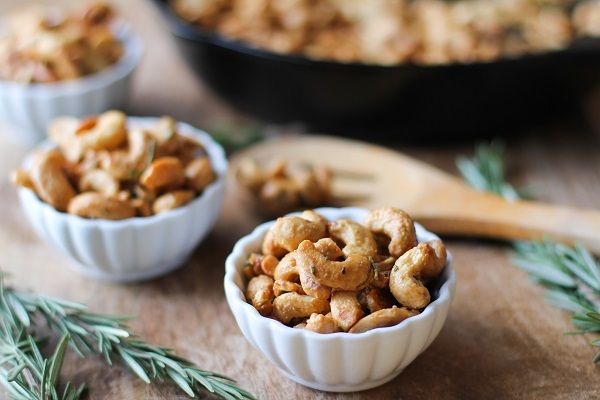 Maple and Rosemary Toasted Cashews are an easy, healthy, and delicious snack for entertaining guests! Did I ever tell you about the Epic Nutcracker Disaster of 1995? Growing up, my sister collected nutcrackers (the toy kind, not the functional kind), and would receive one every year for Christmas. She took very good care of her collection, and always took pride in bringing the pretty little guys out for decoration around the holidays. Along with all of our holiday decorations, my family always had a bowl of shell-on walnuts for the cracking and snacking on our coffee table. Can you tell where this is going? You know me too well. Being the practical and resourceful person I am, I assumed toy nutcrackers doubled as an actual nut cracker. False. The things are useless for cracking nuts. You learn this the hard way, when you take one of your sister’s cherished nutcrackers and attempt to crack nuts with it. In spite of your persistent efforts, you will 1.) end up with a nut that is still encased in its shell, 2.) disfigure the nutcracker, 3.) need to find hiding place for the nutcracker, slash someone to frame for said disfiguration. One of the merits of having several siblings is having ample resources for blame diversion. So the blame circulated among the Mueller children until everyone forgot about the incident, which, believe you me, took YEARS. While my family still breaks out the shell-on nuts, we are also big fans the convenience of shelled nuts. We’re all about having tasty and easy-to-prepare healthy snacks around the holidays, because hangriness runs thick in our blood. For snacking convenience, we keep out a continuous array of cheeses, fruit, and nuts for the eating during holiday get-togethers. 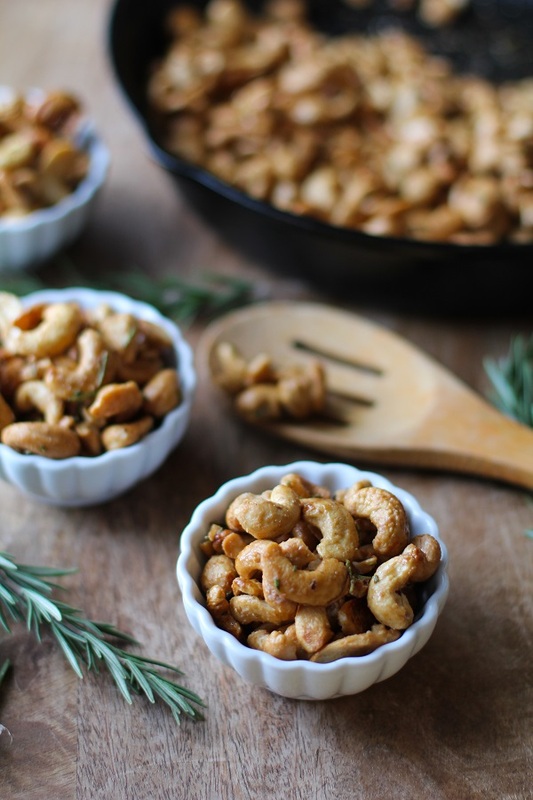 Enter: Maple and rosemary toasted cashews. #GoNuts! This simple recipe calls for pure maple syrup and coconut sugar for some natural sweetness, along with fresh rosemary and ground cinnamon for some warm holiday flavor. Nuts are full of healthy fats, protein, vitamins and minerals, making these a healthful snack to ward off the hangry. Bonus points: these take only 10 minutes to make. BOOM Perfect Holiday Snack Award in the bag. No nutcrackers were harmed in the making of this recipe. Add all ingredients to a 10-inch cast iron skillet and heat to medium. Stir constantly for 8 to 10 minutes until all the liquid is absorbed and nuts are golden-brown and crispy. 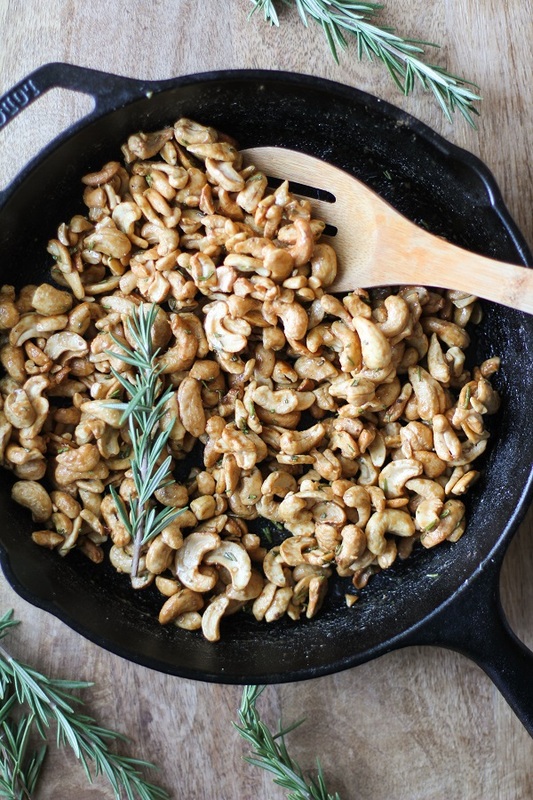 Remove skillet from heat and allow cashews to cool slightly before serving. This post is sponsored by Planter’s Peanuts. I received product from Planter’s Peanuts and was compensated for my time. All opinions are my own. Remind me to send you the squirrel nutcracker that’s been passed around as a “gift” between me and my sisters for a few years. I never buy shell on nuts, so I have no idea if it’s function or not. I prefer to buy them and eat them as immediately as possible, but this sweet and savory toasty recipe sounds worth the extra few minutes before I inhale them! You’ll LOVE these cashews, sister…definitely worth the 8 minutes! They’re addicting! YUM! Love the rosemary on these! Sweet candied nuts are pretty irresistible. 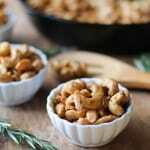 I love having shelled nuts because it takes a little longer to eat them so I don’t go too crazy on the nut consumption.This recipe looks great, thanks for sharing. Nutcrackers are probably the coolest thing to collect ever. Thankfully, my sister is a hoarder and decided to keep the disfigured nutcracker…said disfiguration only builds character, right? Glad you’re on board with the maple rosemary toasty cashews! Thanks girl! I love using maple or honey for toasting nuts, along with hearty herbs…the combo always turns out so flavorful! Enjoy! Yum! Cashews are my absolute favorite. And well, you know how I feel about maple syrup. I’m an only child so I never had anyone to blame but myself for mis-happenings. Blaming stuff on the dog didn’t really work….my parents were onto that whole deal pretty quickly. I love your nutcracker story, and trying to put blame on siblings. It reminds me of my favorite happening from my childhood. I have two younger sisters, one of whom has always been a bully and managed to get us blamed for what she did. One day my youngest sister got payback: she carved the other sister’s name into the arm of an antique chair, and that sister actually got punished for it. My youngest sister and I still laugh about that to this day (it happened at least 50 years ago) – but not the sister who got the punishment, of course. These cashews sound absolutely wonderful. I’ll have to make them. LoL 🙂 We had decorative nut crackers all over my parent’s house when I was a kid – so this story gave me the warm fuzzies. These would be great little Xmas gifts for colleagues ! My thoughts exactly! Wrap these up in a purdy bag with a bow and you’re looking at an easy and delicious gift. You know….I’m not sure I have ever toasted a cashew. And now I feel like I’ve never truly lived. Oh girl, getcha some cashews! You’ll love them, especially if they’re toasted up with maple syrup and rosemary! I have used this recipe to make almonds. And it was incredibly delicious! I even was not expecting that tasty thing. I am declared fan of yours. Everything you do is extremely tasty!